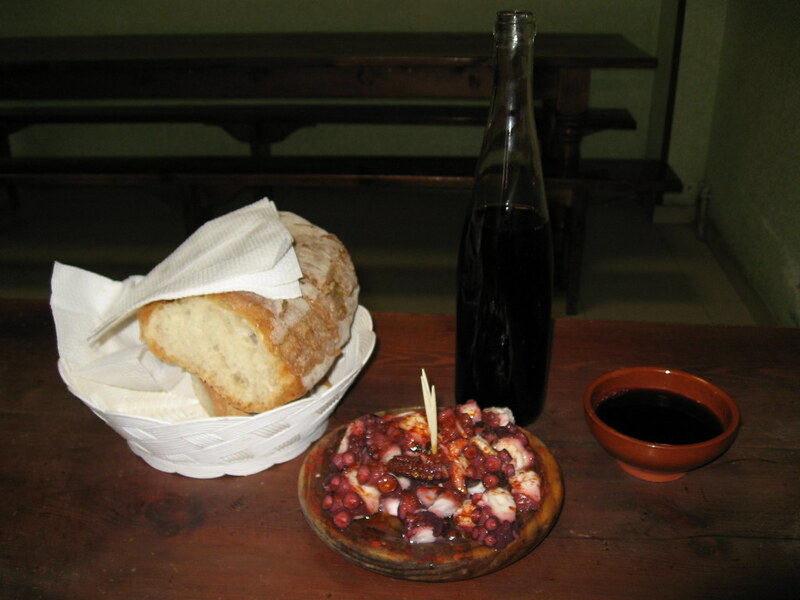 Camino Lola: Day 26: "I have a date with an octopus." Day 26: "I have a date with an octopus." Believe it or not I said this to a older German man as I passed him today. [ I later found out his name was Heinz.] He must have enjoyed it as he guffawed once he deciphered my words & probably thought I was crazy as I sped my way past him at Mariette-speed to Melide. I was originally was only going to walk 25km today & stop at Palais de Rei. I got there fairly early (like 11:30am) had a coffee & thought: "I want to get to Melide! 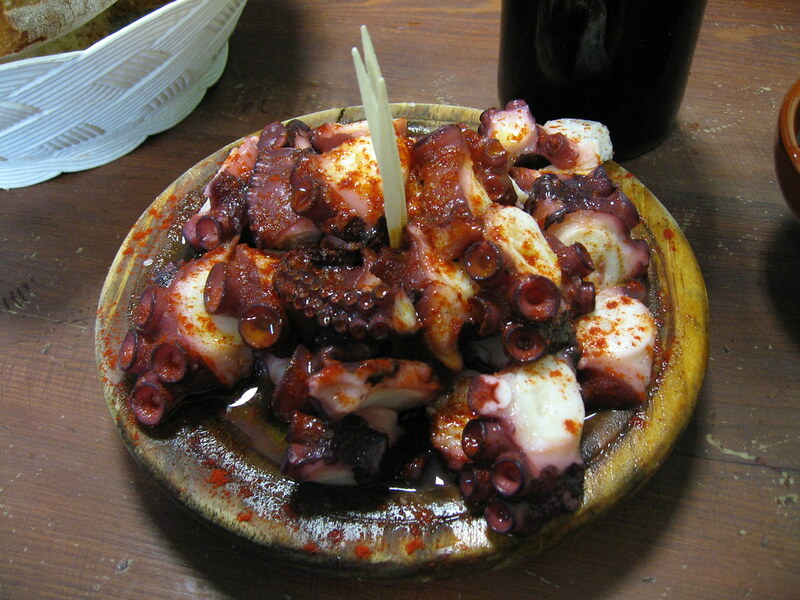 I want pulpo!" So once again, I ended up doing another 40km. Tell me *that's* not worth it?? If I push I will be in Santiago in two days. However, if I take it easy, I can still arrive in the morning at Santiago on the 23rd, meaning I can have two and a bit days in Santiago, the rest of the 23rd, one night in Finisterre, the 24th, the 25th & leave for London the 26th. I'm hoping to slow down. I don't want to walk anymore, but the little 15-19kms a day will be easier, I think. I was the first one in the door [ at the Pulpería] just before 7pm. But by the time I left, about 8pm, the place was jammed with pilgrms, tourists & Spaniards for Saturday night. 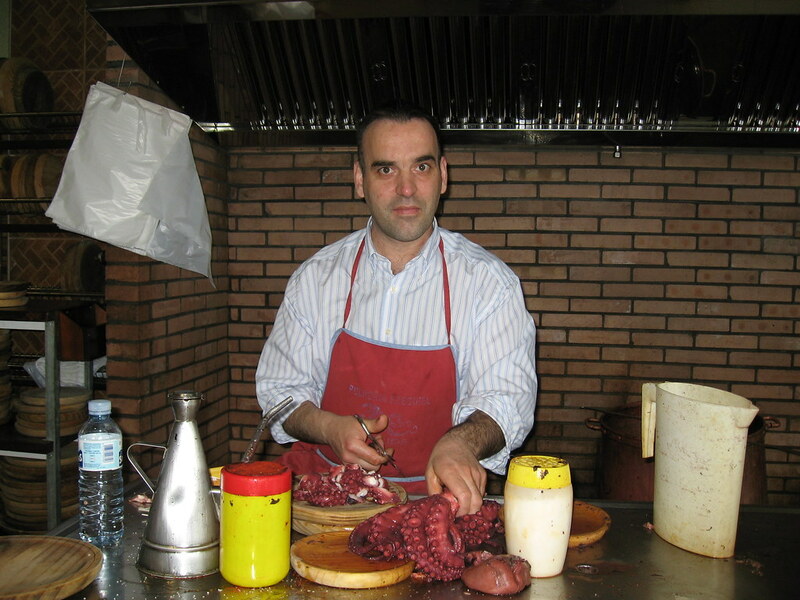 I especially loved hearing the owner snip snip snipping away all the octopus as more people started to swarm in. Then on the way back to the hostal, (I splurged again, because I wanted to relax after the 40km), who did I see but John & Gen, the Aussies from way back in Viana! On the camino, its easy to meet people everyday & quite often you run into the same crowd along the way. But being so transient, and sometimes one goes further, etc., one can feel quite lonely and a bit tired of the meet & greets. Just the other night, at Ohhhh Cebreiro, I finally had introductions with a German woman who had sprayed antisceptic on my deep knee wound way back in Redecilla. I was walking up that steep climb earlier that day, and suddenly her & her friend were next to me and we erupted into this scream of joy! This seems to happen a lot, at least for me, this recognition & some comfort in a familiar face. And that night at the top overlooking the incredible view, Brigette (this German woman) and I hugged, and introduced ourselves for the first time! Had a glass of wine with John & Gen as they finished their supper, and gave them M's and my cell numbers so that hopefully we can all meet up in Santiago for dinner next week. Only 50kms left, people... 50kms to go! Day 1: I made it Roncevalles!!!! Day 2: Number of Items Lost: 1 Day 3: Items found: 3, and the easy day that wasn't... Day 4: The grass IS greener Day 5: WHY am I doing this again? Day 6 & 7: Still muddy, still painful Day 8: Je ne veux pas travaille, je ne veux pas dejeuner... Day 9: Small villages are just that. Day 10: A night of paranoia & truck stop towns... Day 11 & 12: The Opposite Sides of Hell Day 13: And then, Heaven decided to gift me today.... Day 14: It pays to walk a little, or a LOT further... Day 15: "It's a long way to the prairie..." Day 16 & 17: 30km is the new 20km Day 18: And then, Lola rested Day 19: A day off may be hazardous to your walking Day 20: The wind NOT at my back Typical day on the camino Day 21: The Fog in Foncebadon Day 22: Glass half empty or full: as long as its vino, its ok Day 23: Ohhhhhhh Cebreiro! Day 24: REALLY roughing it. Day 25: A room with a view. Day 26: "I have a date with an octopus." Day 27: One day more Day 28: Ladies & Gentlemen, Lola has entered the building... Pilgrim Spotting Day 29: I came, I saw, I slept. Sitting at the end of the world... Somewhere in between... slideshow! Happy Camino Anniversary! Day 25: A room with a view. Day 24: REALLY roughing it. This is a Flickr badge showing photos in a set called camino lola. Make your own badge here.